The Atlas 5 rocket bearing the U.S. Air Force's first Space-Based Infrared System (SBIRS) missile-warning satellite, GEO-1, is shown in close-up, in preparation for its scheduled May 6 launch. The United States military will take a big step toward upgrading the nation's missile-defense system this week, when it launches the first in a constellation of next-generation surveillance satellites. On Friday (May 6), the Air Force will launch GEO-1, the first of four new satellites planned under the Space-Based Infrared Systems (SBIRS) program. SBIRS will significantly improve the country's missile-warning and missile-defense capabilities, and it will also provide enhanced technical intelligence to fighters on the ground, Air Force officials said. "Once launched and fielded, GEO-1 will bring the dawn of a new era in persistent overhead surveillance," Brigadier General-select Roger Teague, head of the Infrared Space Systems directorate at Los Angeles Air Force Base's Space and Missile Systems Center, told reporters last Tuesday (April 26). The Air Force already has an extensive satellite network that scans the globe for the telltale heat trails produced by missile or rocket launches. The first spacecraft in this venerable Defense Support Program (DSP) was launched in 1970, and the latest blasted off in 2007 (though that one failed in orbit). The purpose of SBIRS, Teague said, is to augment and upgrade the capabilities provided by DSP. The SBIRS program began to take shape in the mid-1990s, and its development has been hampered by a series of delays and engineering problems. "This program has certainly faced and overcome a number of challenges in the past," Teague said. But things are looking good now, officials said. The instruments aboard the $1.3 billion GEO-1 and its three planned satellite siblings will provide a significant leg up over what DSP craft can do. "These systems are so much more sensitive," Teague said. "We can see much more, much earlier, much sooner -- many dimmer targets than we ever could before." In addition to spotting missile and rocket launches, GEO-1 and the other SBIRS satellites will also be used to gather more general "technical intelligence," officials said. "Technical intelligence is a broad mission, primarily looking at new targets, and I can't get into much more specifics than that," said Jeff Smith, SBIRS vice president at Lockheed Martin, the Air Force's prime contractor for the program. "The data that we collect is used to figure out the profiles and what new targets are out there." GEO-1 will do its work from about 22,000 miles (35,406 kilometers) above Earth, sitting in a geosynchronous orbit (hence the satellite's name). It will peer at the land below using two sensors, a "scanner" and a "starer." The scanner will cover a wide swath, looking for missile and rocket launches, while the starer will concentrate on smaller "areas of interest," officials said. While GEO-1 will be the first of the dedicated SBIRS satellites to reach orbit, it's not the first piece of the program to take to the skies. The SBIRS plan also calls for four other sensors, which will be incorporated as payloads into four different "host spacecraft" and peer down at the Earth from highly elliptical orbits. The Atlas 5 rocket bearing the U.S. Air Force's first Space-Based Infrared System (SBIRS) missile-warning satellite, GEO-1, is shown, in preparation for its scheduled May 6 launch. Much about these other sensors is classified, including the identity of their host satellites. But Teague confirmed that two of these payloads have already been launched. "We're very pleased with the performance of those systems," he said. 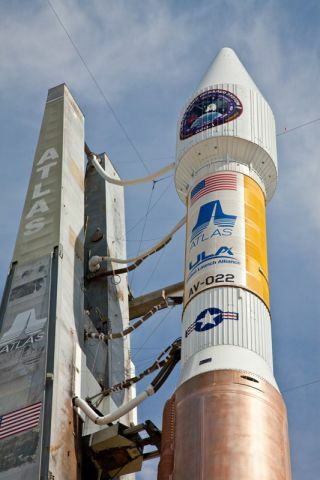 GEO-1 will launch May 6 from Cape Canaveral Air Force Station in Florida aboard a United Launch Alliance Atlas 5 rocket. The satellite will settle into its orbit nine days later, then begin a series of check-outs and tests. The satellite should start sending useful data to the intelligence community within six months, officials said. It's expected to be fully cleared for all operations -- after a stringent certification review -- within a year and a half. The other satellites will follow GEO-1 into orbit over the next five years or so. The last of them, GEO-4, is slated for launch around 2016, Teague said. This article was provided by Innovation News Daily, a sister site to SPACE.com. You can follow SPACE.com senior writer Mike Wall on Twitter: @michaeldwall and get the latest in space science and exploration news from @Spacedotcom and on Facebook.